Working Class Man is the #1 book in Australia! New ‘Stories & Songs’ shows announced. 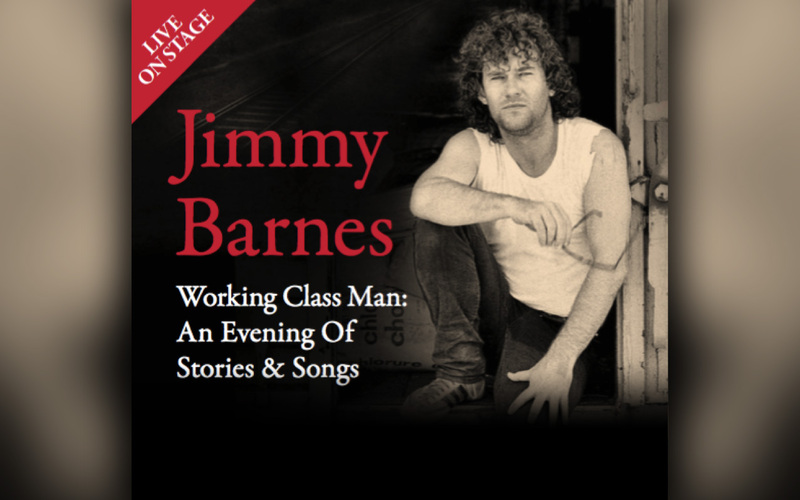 Jimmy Barnes’ new memoir – Working Class Man is the #1 book in Australia! Jimmy Barnes’ critically acclaimed new memoir “Working Class Man” has gone straight to #1 on the Neilsen Bookscan chart today, knocking “Da Vinci Code” author Dan Brown from the top spot nationally. “Working Class Man”, which details Jimmy’s rock ‘n roll excesses, sold over 20,000 books and eBooks in its first week. This is more than any memoir/autobiography/biography – local or international – since records have been kept in Australia. Its predecessor “Working Class Boy” has also returned to the Top 10 of the Neilsen Bookscan Non-Fiction chart. The Working Class Man: An Evening of Stories & Songs tour has also struck a deep chord around Australia with shows in Thirroul, Canberra, Cairns, Newcastle, Bathurst, Frankston, Sydney and Melbourne all selling out already. As a result, a second and final date at the Canberra Theatre Centre has already been added on Sunday, 18 March. New shows have also been announced at the Brisbane City Hall (10 April), Sydney Town Hall (2 May), Newcastle Civic Theatre (6 June), Melbourne’s Palais Theatre (9 June) and the Thebarton Theatre in Adelaide (10 June) with tickets for those dates going onsale at 9.00am local times today. Tickets for all remaining dates are selling fast. Fans are reminded to only buy tickets by following the direct ticket links here. People who choose to ignore this clear advice and who instead use search engines like Google to find tickets typically get steered to unofficial reselling sites like Viagogo that often lead to rip offs. Tickets for all new shows will go onsale at 9.00am local times today – Thursday, 2 November. Working Class Man: An Evening of Stories & Songs is presented by Triple M and MAX. The tour will also help promote the good work of Lifeline (www.lifeline.org.au) as Jimmy will be drawing further attention to the issues of addiction and mental health in both his new book and live show. To coincide with the release of “Working Class Man”, Bloodlines/Mushroom has released a limited edition, commemorative version of one of the greatest Australian rock albums of all time, For The Working Class Man, which includes a never before released DVD from the legendary Playroom in Queensland in 1984.